So, it's been a rainy week in Toronto and our backyard has turned into a mud pit. 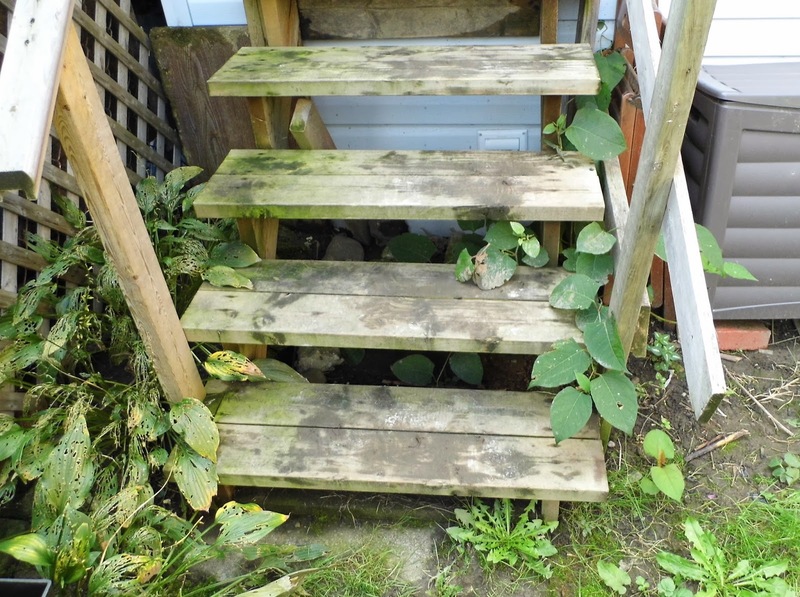 You may recall that in the summer, we were beginning to show our yard some TLC but we haven't touched the actual lawn, since we're hoping to be building a deck next year. 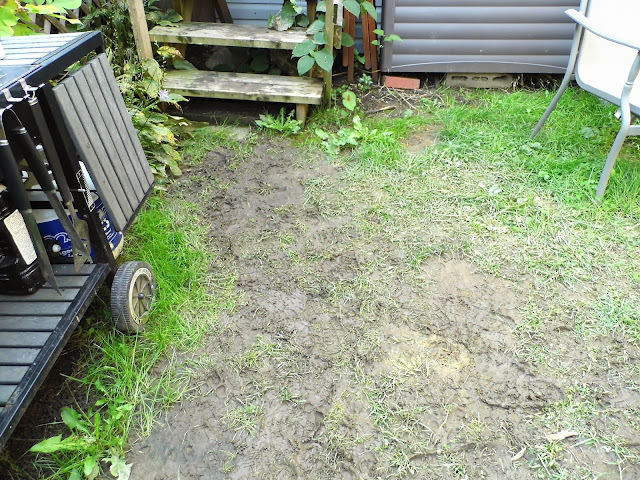 Unfortunately, this leaves us with a yard full of gloppy mud... especially in the high traffic areas. Worst of all (for a clumsy person like me) it's slippery! Here's a quick look at the stairs as well. I can't wait to replace this deathtrap! The wood hasn't been maintained and when it's wet, it feels like it's covered in oil! In case you're wondering, I have only fallen down these stairs once and it wasn't serious at all. Anyway, I was sick of Barkley tracking mud into the family room, so we finally bought some mulch to cover the mud. So far, it's working like a charm and once the steps dry, we're going to apply a non-slip coating. 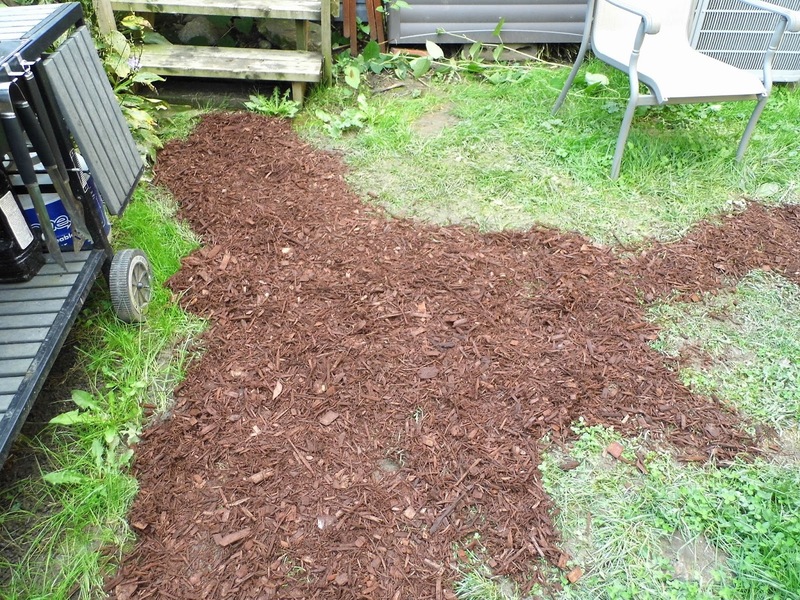 I would say it's MULCH better! Sorry, I couldn't help myself. Actually, I was surprised by the fact that I actually don't hate the way it looks. 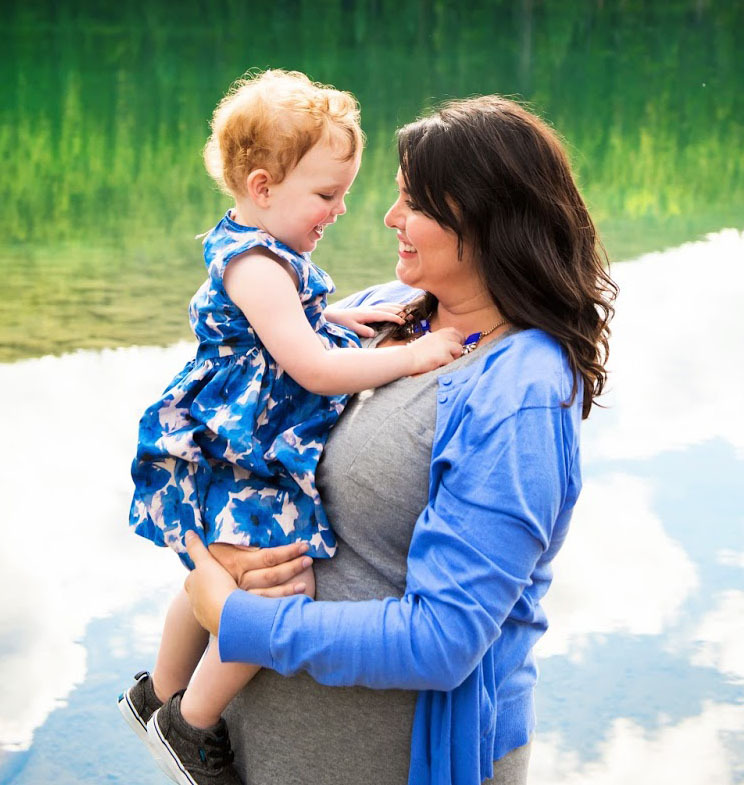 I don't think I could ever cover our entire yard, because I'd miss the grass, but covering part of the yard could really cut down on our lawn maintenance. Corey and I are considering this as a temporary fix until we can build a deck. 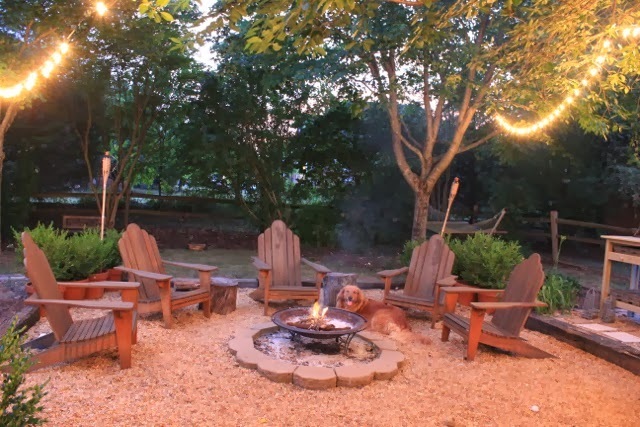 I think I was drawn to this one because of the fire pit and I found the picture on a blog called Daisy Mae Belle. 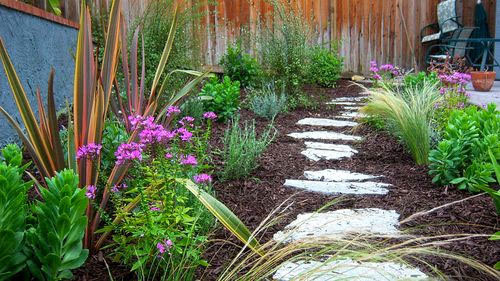 This next picture is by Gardenwright Landscape and Design and it makes me want a stone pathway in our yard. Their blog points out that reducing your lawn area is also a great way to conserve water. 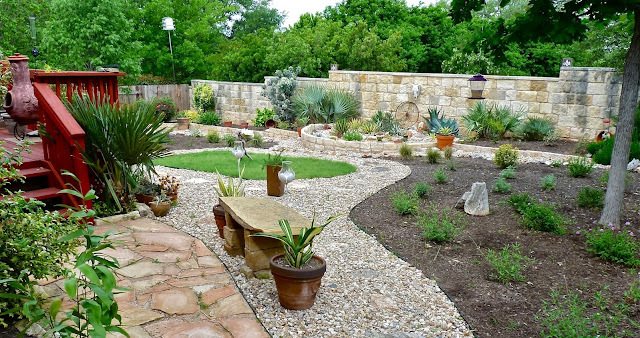 This picture from Ideas for Backyard Landscaping makes me like the idea of a curved edge with small shrubs and plants poking through. And finally, this picture from Good Earth is a little too planned for my taste but it illustrates many of these ideas very well! What do you think? 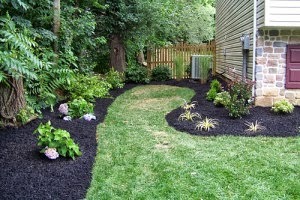 Would you trade in some of the grass in your own yard for mulch?